The US Domestic Agency achieved a major milestone in February by completing the delivery of all US-supplied toroidal field conductor to the European toroidal field coil winding line at ASG in La Spezia, Italy. All certificates of acceptance have been signed for the nine lengths of conductor, totalling over 7,000 metres. 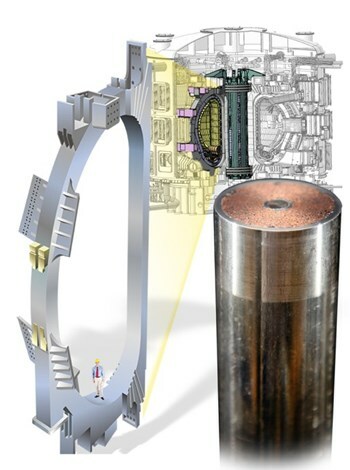 The US Domestic Agency, managed by Oak Ridge National Laboratory, has now completed its contribution of 8 percent of the toroidal field coil conductor ITER requires; the rest of the conductor has been supplied by other ITER Members. Key industrial partners for this US procurement include: Luvata Waterbury (Connecticut) and Oxford Superconducting Technologies (New Jersey) for strand production; New England Wire Technologies (New Hampshire) for cabling; and High Performance Magnetics (Florida) and Criotec (Chivasso, Italy) for jacketing and integration. At the height of fabrication, US vendors Luvata and Oxford Superconducting Technologies were producing over five metric tons of superconducting strand per month. The ITER facility will use approximately 80,000 km of low-temperature, helium-cooled superconducting wire to generate the immense toroidal magnetic fields needed to confine the 150-million-degree-Celsius plasma inside the ITER Tokamak. Eighteen toroidal field magnets, weighing more than 6,500 tonnes, will have a total magnetic energy of 41 gigajoules and a maximum magnetic field of 11.8 tesla. As a partner in ITER, the US is providing hardware for multiple ITER systems. The US project will complete its next system contribution—components for the steady-state electrical network—later in 2017. Deliveries of toroidal field conductor from the US began in 2015.